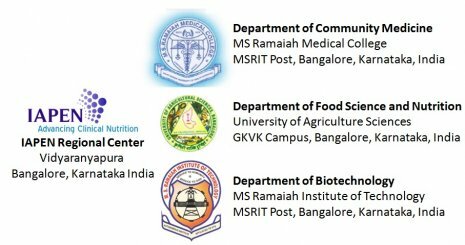 The first annual meet and conference of The Indian Association of Parenteral and Enternal Nutrition (IAPEN) is organized and hosted by The Department of Biotechnology, M.S. Ramaiah Institute of Technology in association with The Department of Community Medicine, M.S. Ramaiah Medical College and The Department of Food Science and Nutrition, University of Agricultural Sciences on 4th August, 2012 at M.S. Ramaiah Institute of Technology, Bangalore. This annual meet and conference is coordinated by the Bangalore chapter of IAPEN. Malnutrition is a complex & multidimensional problem with determinants beyond the health sector. Hence there is a need to bring together experts from various sectors like public health, biotechnology, food science and nutrition etc, on a single platform, to facilitate exchange of knowledge and research updates. This will catalyze promotion of inter-sectoral coordination, so as to arrive at comprehensive and sustainable strategies to address the problem of malnutrition. The first annual conference of IAPEN will provide such a forum for multidisciplinary interaction on malnutrition. Despite constant interventions from both public and private sector to control malnutrition at community level, evidence points that there exists various challenges and bottlenecks, to decrease its prevalence and severity. It is the need of the hour to arrive at scientific and sustainable solutions to address the same. Hence the theme chosen for the conference is "Prevention and Management of Malnutrition : Challenges and Solutions"
Registration Details: Interested in submitting abstracts to this conference? We recommend that you review the About Conference page for the section policies, as well as the Author Guidelines. Authors need to register with the Conference Website by 'Account' menu prior to submitting, or if already registered can simply log in and begin the abstract submission process. Join IAPEN todayto help our important work and benefit from fantastic savings for paper presentation competition and award function. We are pleased to advise that we are handling complete responsibility of accommodation of participants. Accommodation is not exclusive to IAPEN Members therefore if you have any colleagues that wish to be accommodated in the same hotel we will be happy to reserve their rooms too. Email to iapenmeet@gmail.com for more information about accommodation. Bangalore, also rendered Bengaluru, is the capital of the Indian state of Karnataka. Bangalore is nicknamed the Garden City for its gardens and parks. Located on the Deccan Plateau in the south-eastern part of Karnataka, Bangalore is India's third most populous city and fifth-most populous urban agglomeration. Bangalore is well known as a hub for India's information technology sector. Bangalore is known as the Silicon Valley of India because of its position as the nation's leading IT exporter. It is among the top 10 preferred entrepreneurial locations in the world and the second fastest growing major metropolis in India.